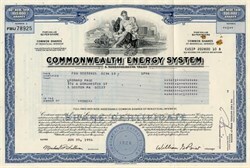 Beautifully engraved certificate from the Commonwealth Energy System issued in 1996. This historic document was printed by American Bank Note Company and has an ornate border around it with a vignette of an allegorical man. This item has the signatures of the Company's President and Secretary. Commonwealth Energy System, based in Cambridge, was a holding company with subsidiaries including Advanced Energy Systems, COM/Electric, COM/Gas, and COM/Energy Steam companies. NSTAR was formed after merger transaction between Commonwealth Energy System (COM/Energy in 1999, formerly the parent of the Company) and BEC Energy (formerly the parent company of Boston Edison Company). NSTAR (NYSE: NST) is a private utility company that provides retail electricity and natural gas to customers in eastern and central Massachusetts. NSTAR was formed in 1999 by the merger of BEC Energy and Commonwealth Energy System. NSTAR currently has the following operating units: Boston Edison Company, Cambridge Electric Light Company, Commonwealth Electric Company, and NSTAR Gas Company (formerly Commonwealth Gas and Cambridge Gas Company). As a part of deregulation of the local electrical power industry, NSTAR has divested itself of all electric generation facilities, keeping only those elements of the business which remain regulated. NSTAR has ownership of unregulated district energy and telecommunications businesses including Medical Area Total Energy Plant, Inc. which produces electricity, steam and chilled water for sale to customers in the Longwood Medical Area of Boston. NSTAR sold its interest in the Seabrook Station nuclear power plant to FPL Group in 2002.